Volumetric Technologies is proud to manufacture the highest quality and most advanced pail filling machines in the industry. Our Pail Filling Machines are Net Weight Fillers that accurately and automatically fill pails by weight in an efficient manner. For your food, cosmetic, or chemical filling applications, Volumetric Technologies Pail Filling Lines are the perfect solution, with a perfect fit, every time. These fillers are programmed with user friendly menu driven operator controls by weight to ensure an accurate fill. The net weight fillers come standard with a stainless steel closed top conveyor and optional rotary tables. They are fully adjustable with automatic indexing and filling pump systems. Both fast and slow speed fill nozzles have PLC controllers. Stainless steel features all around including guide rails, conveyor legs, and leveling pads. These lid presses feature stainless construction, steel framework, and a heavy duty chain with positive drive lugs. The press is adjustable to lid containers of all sizes with a hand wheel. The press also features locking mechanisms on all four corners, heavy duty gearbox, variable speed frequency drive, and steel leveling pads. The denester separates the pails to accept multiple sizes with minimal changeover. They are pneumatically operated with a photo eye container sensor. As always, all stainless construction for easy cleaning. 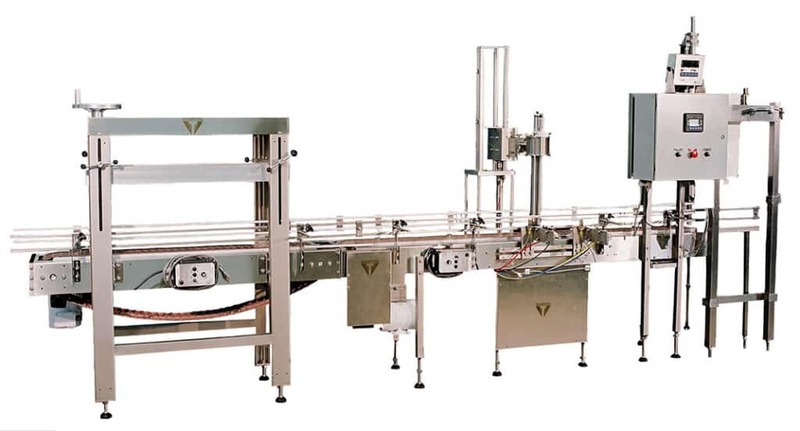 Whether chemical, cosmetic, or food, Volumetric Technologies Pail Filling Machines are perfect for all filling needs. These customizable filling machines are powerful and efficient to fill a variety of containers, and are leading the way in packaging equipment production. See how we can help your business, call us at 507-263-0034.